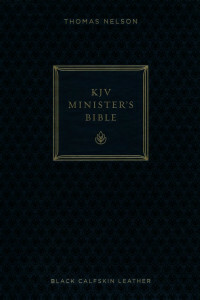 The KJV Minister's Bible is the perfect resource for busy pastors. Its a one-stop Bible providing direction for weddings, funerals, communion and baptism services, confirmations, and more! Black Genuine Leather. 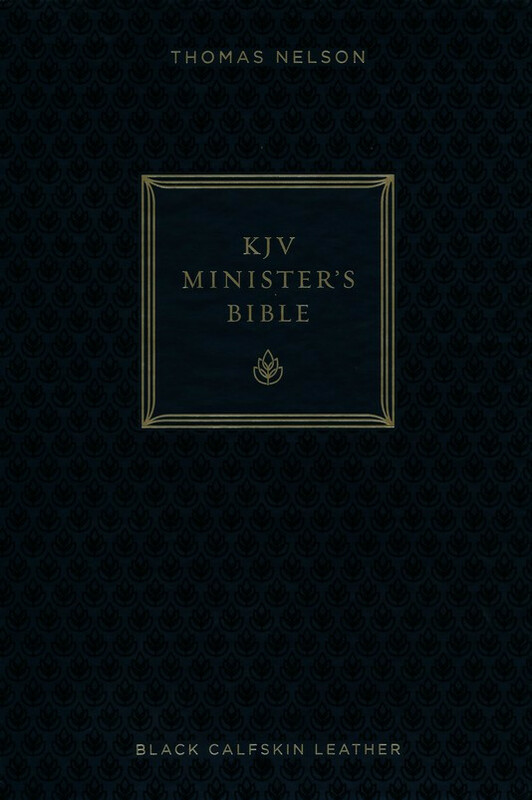 KJV Ministers Bible, published by Thomas Nelson Publishers, is a Bible designed aid pastors and lay leaders as they strive to meet the daily needs of their congregations. This Bible comes printed in the new Thomas Nelson easy to read KJV comfort print, which is presented in an optimal 9-point type face. This new type is designed to help the avid student spend more time within the Word without placing a great deal of strain upon the eyes of the reader. This Bible features many of the common features of the average Bible, but what makes this Bible unique is the extraordinary number of extra features present. Within its pages, tucked in between the Old and New Testaments, you find such features as: Scripture readings for special occasions, service outlines, prayers, wedding, funeral, communion and baptism guides, as well as many other amazing features. Other features included; lay-flat binding, brown leather soft flexible cover, three satin ribbon markers, 30 days with Jesus, a one year reading plan and colored maps. This Bible would make a wonderful asset to any pastors library; thus, it is a highly recommended purchase for personal use or as a gift for your pastor.